This might be me in 9 days. Today, from napowrimo, the suggested prompt is to take a favorite poem and find a very specific, concrete noun in it. After choosing the word, put the original poem away and spend five minutes free-writing associations – other nouns, adjectives, etc. Then use the original word and the results of the free-writing as the building blocks for a new poem. And from this lovely line I will choose the word “gin.” I couldn’t begin to tell you why this particular word strikes my fancy at this time. #whole30. Okay, enough of that. Let’s write a poem. Here’s an attempt at a formal structure that totally breaks down at the end. Sorry. at least of the alcoholic variety. Who’s to say my first drink will be gin? a close second, a balance of dark and light. It’s not like I’m counting down to gin. another 30 without a drop of gin. I am looking forward, that’s all. I attended a writing workshop last weekend taught by the Oregon Poet Laureate Emeritus Paulann Petersen where I was asked to participate in a generative process very much unlike the process I am used to in my own creative work. 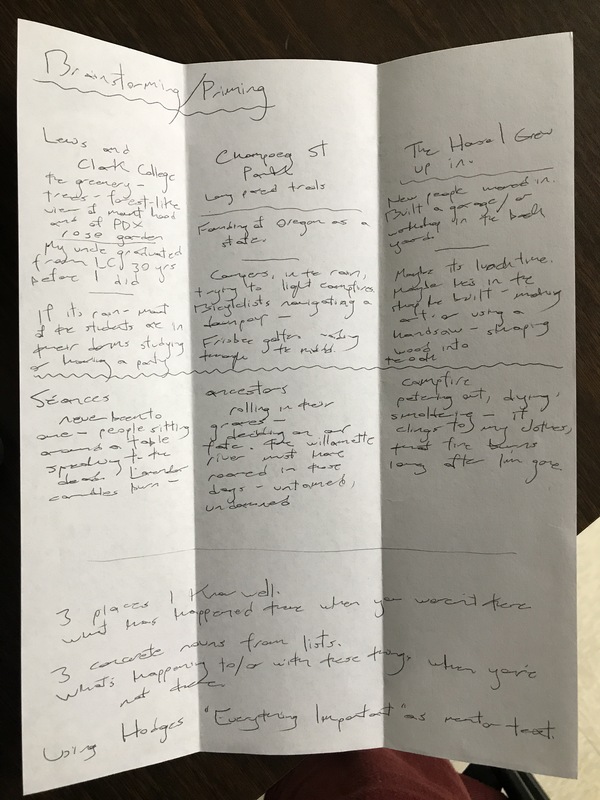 It was a very particular kind of brainstorm activity she called “priming.” Now, as a teacher of writing, I ask my students to brainstorm often–but it typically takes a pretty simple or mundane form: freewriting, listing, word mapping, that sort of thing. And I will often do that with them to generate pieces of my own–right along with my students. But left to my own devices, (true confession) I most often skip the brainstorm/priming process altogether. I dive in feet or head first and swim. My brainstorming occurs simultaneously with composition; I storm as I create–in both fiction and in poetry. long after I’ve already gone.